It's official: There are no more rhinos left in Vietnam. 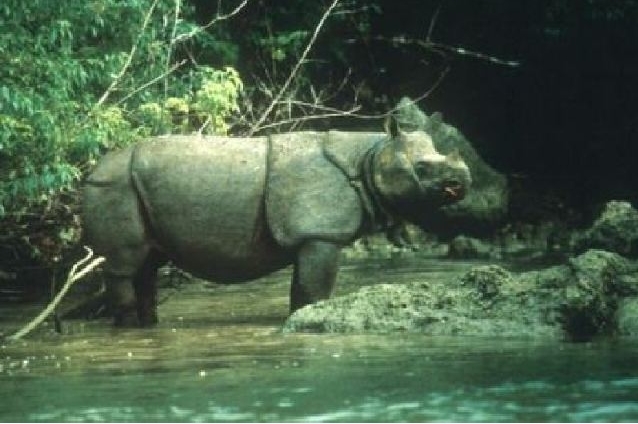 A large female Javan rhino, estimated to be between 15 and 25 years old, was shot and killed in late April 2010, and had its horn removed by a poacher. Turns out it was the country's last, as reported by Rachel Nuwer at Take Part, a digital media and advocacy company. It's the second subspecies of Javan rhino to go extinct. The third subspecies remains in Indonesia, likely confined to a single park, where as few as 35 of the critically endangered animals survive. A camera trap caught video of a mother Javan rhino and her calf in Ujung Kulon National Park in 2011. It's not known whether the population is increasing or decreasing, and their survival remains in doubt, according to the International Union for the Conservation of Nature, a global network of government and private groups that assesses the extinction risk of species. DNA analysis of rhino dung in Vietnam's Cat Tien National Park in 2009 found that only one rhino remained at that time — the same one that was shot a year later, according to a study published recently in the journal Biological Conservation. The conservation group the World Wildlife Fund declared the rhino extinct in 2011, but it wasn't until late 2012 that the aforementioned study was published in a peer-reviewed journal with data showing that the animal is extinct in Vietnam. Throughout Southeast Asia, animals are vanishing from forests largely due to a renewed demand for their parts in traditional medicine, Nuwer reports. In the rhino's case, its horn likely ended up in a tonic to cure cancer, treat hangovers or tame fevers, according to Nuwer, who has studied wildlife poaching in Vietnam. But studies have shown that the rhino horn has no medicinal value, and consists mostly of keratin, a major component in human fingernails and hair. "The Javan rhino is only the tip of the iceberg," said study author Sarah Brooke, with the conservation group Flora and Fauna International Cambodia, according to Take Part. "Many other species are declining rapidly in Vietnam and remain in only fragments of their former ranges with very small populations." The Javan rhino is possibly the rarest large animal on Earth. They are one of the smaller rhinos, however, weighing about half of what white rhinos do, between 2,000 - 5,000 pounds (900 - 2,300 kilograms), and standing up to 5.8 feet (1.8 meters) tall. As solitary forest-dwellers, they are very rarely seen, and little studied. Responses to "Javan Rhino Officially Extinct In Vietnam"
The horrible human stupidity....to destroy what they want the most instead of preserving it....utterly revolting. I enjoyed the video, but the rest makes me sick. At this rate there won't be any Rhinos left anywhere - except in zoos & wildlife parks. If you think about it between Rhinos, Elephants and Tigers if we keep this up yeah like a young lady here said the only ones left will be in Zoo's and Parks. But what happens when the ones in Zoo's and parks die out ???? WHAT THEN ???? Congratulations, you did it. Now, isn´t that great that you killed the last ones living freely, as they supposed to for f... medicine? What kind of century are you living in? You build cars, produce technical appliances and so on - but still use medicine made from the horn of Rhinos??? You know what? If all of you would die tomorrow... I wouldn´t give a damn! This is tragic. I say, we, the Humans were the most disgusting Species on this Planet. God, if are there, thanks for the developed brain.WE failed. Game over.